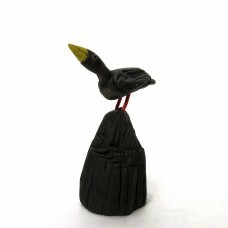 This is a Raku fired sculpture of a bird on a rocky outcrop.Female of the rock dwelling spieces, this bird has a bright yellow beak and hangs out at the rougher end of the cove. Joins in with alot of roudy behaviour.. 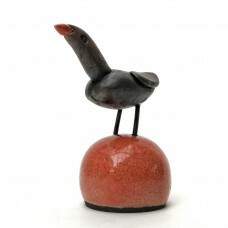 This is a Raku fired sculpture of a bird with a small stand.The wings are folded, the sculpture nestles comfortably in the hand.It would make an unusual gift for a bird lover and is very tactile.The modelling&n.. 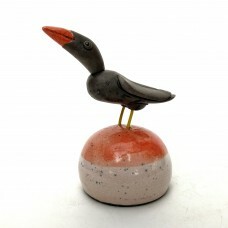 This is a Raku fired sculpture of a bird with a small stand.This sculpture nestles comfortably in the hand.It would make an unusual gift for a bird lover and is very tactile.The modelling is done by hand a..
Raku fired sculpture.This is a Raku fired sculpture of a Bird poised on a Head. The head appears partially submerged. 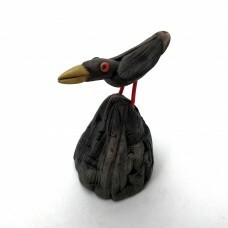 It is smoke fired and has a subtle black patina from the burning straw. Dimensions: 6.25" height x 5" d.. 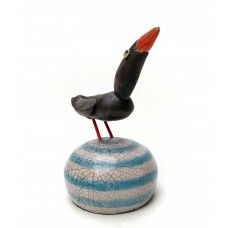 This is a Raku fired sculpture of a bird on a buoy.Inspired by the seabirds seen perched on mooring buoys in many harbours around the UK. The birds seem to embody the spirit of untameable independence, touchin.. 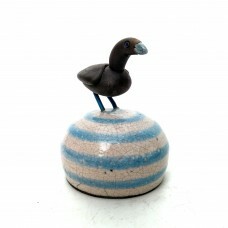 This is a Raku fired sculpture of a bird on a buoy.Inspired by seabirds perched on mooring buoys in many harbours around the UK. 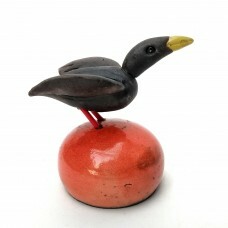 The birds seem to embody the spirit of independence and the untameable, touching the edge .. 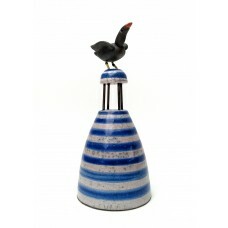 This is a Raku fired sculpture of a bird on a buoy.The modelling is done by hand and is unique to this sculpture. 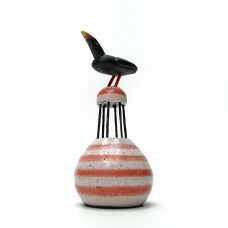 The legs of the bird and parts of the buoy are made from wire. 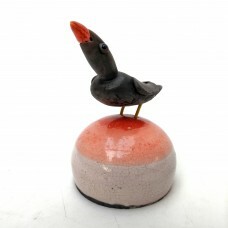 Coloured raku glazing adds a juanty fe.. 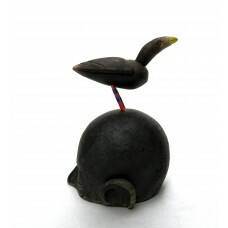 This is a Raku fired sculpture of a bird on a buoy.The bird has opened its wings, as if drying out its feathers in the sun. One of the neater inhabitants of the harbour this one has a care for its appearance. It is also .. 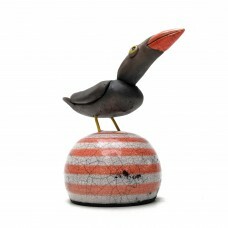 This is a Raku fired sculpture of a bird on a rocky outcrop.A brasher sort of character and a bit of a loud mouth, this bird has a bright yellow beak and hangs out at the rougher end of the cove. 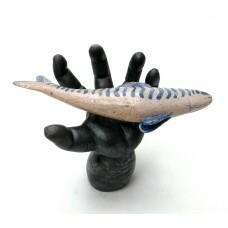 Liable to make impertine..
Sculpture of a stylised hand caught closing around a fish.The modelling is done by hand and is unique to this piece of work. 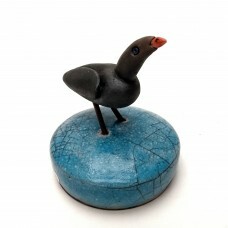 Dimensions: 7.5" height x 9.5" width x 5" length.Materials: Raku fired clay, Raku glaz..
Raku fired sculpture.This is a Raku fired sculpture of a bird bath with a bird in it. It is glazed with white crackle tin glaze and finished with 22crt. gold leaf. Dimensions: 3½" height x 10" diameter. 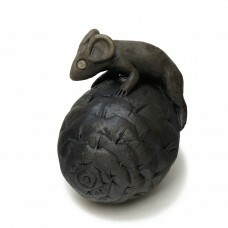 ..
Raku fired sculpture.This is a Raku fired sculpture of a fir cone with a rat climbing over it. 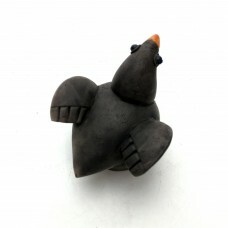 It is smoke fired and has a subtle black patina from the burning straw. Dimensions: 3½" height x 3" diameter. 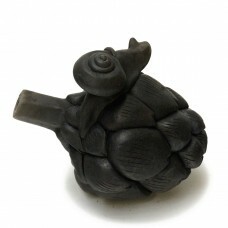 ..
Raku fired sculpture.This is a Raku fired sculpture of a Snail climbing over an Artichoke. 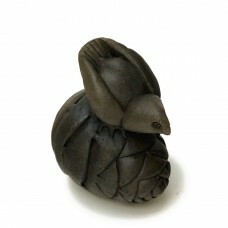 It is smoke fired and has a subtle black patina from the burning straw. 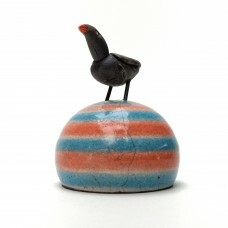 Dimensions: 3½" height x 3" diameter. 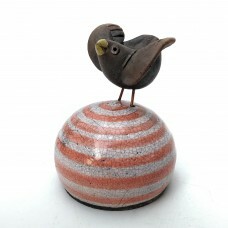 ..
Raku fired sculpture.This is a Raku fired sculpture of a Bird poised on a Fir cone. 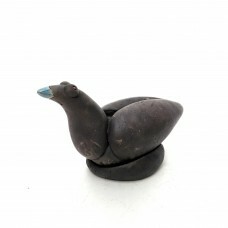 It is smoke fired and has a subtle black patina from the burning straw. 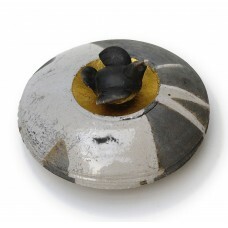 Dimensions: 3" height x 3" diameter. ..